Say hello to Austin Braces, a gorgeous 3 1/2" Braces Boy made in nice natural colours. 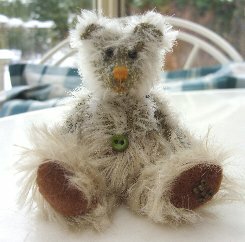 His body is made of olive green backed, pale green mohair, quite short, sparse and straight. His trousers are made of much longer tan backed, blonde gold mohair, straight and quite thick and this lovely long fur gives Austin Braces nice fluffy trousers and a very distinctive appearance. He has toning tan cashmere pads and olive green Sassy fabric paws whilst his braces are narrow white ribbon with multicoloured polka dots on them. Austin Braces is steel shot filled for weight and so is nice and heavy for his size. He has an olive green belly button and a tan stitched nose, whilst his eyes are shiny black English glass. This is a very sweet little bear and I do hope that you like him. He costs £39 plus postage. Please note that as with all our bears, Austin Braces is not a toy and is not suitable for children. Sorry - Austin Braces has been adopted.